The cryptocurrency analytical column provides basic technical cryptocurrency price analysis: the main price indicators, the general trend of movement and the values of popular technical indicators reflecting the current state of the cryptocurrency market over the past trading day as well as cryptocurrency price forecasts for future periods. At the moment, we analyze four most popular crypto active on daily basis: Bitcoin, Ethereum, Ripple, Monero. Please note that since the cryptocurrency is traded in the 24/7/365 mode, for the analysis the day is counted by the London, UTC / GMT + 1 summer, UTC / GMT + 0 winter time zone. Consider this when making your own analysis or using the column information. All quotes for technical analysis are provided by BITFINEX crypto exchange. 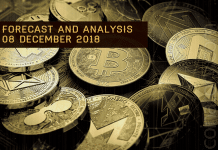 Also at the very end of each article, you will be able to find the current general summary information, such as the total and the available number of coins, traded volume and market capitalization, for each cryptocurrency analyzed.